Do you need a chipped windshield repaired? Did you know you can repair most small rock chip damage? If you have a windshield that was chipped by a flying rock or other item, and if the chip is small enough, we can repair it quickly, on-site, when and where you need it. As an added bonus, most insurance companies will waive your deductible if you choose to have your windshield repaired, rather than replaced. We work with your insurance to make sure you get the maximum value for your coverage. The chip may not be invisible after being repaired, but spreading will be prevented. 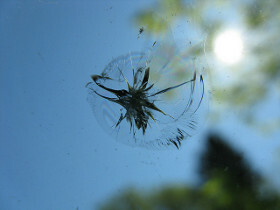 Our technicians will advise you if they think the chip will not fill properly or if your windshield should be replaced. When you repair your windshield chips instead of replacing the whole windsheild, you're helping preserve the environment. Chip repairs take about 30 minutes, so you save time, money and hassle. Plus, you keep your original factory glass seal. You should only replace your windshield if the chips can't be repaired. We will never recommend more work than is required. Anyone from the Phoenix or Prescott areas knows, Arizona is a big place. Big skies, big sunsets, and unfortunately, big rock chips from time to time. We serve the Phoenix metro, including Scottsdale, New River, Black Canyon City and more. We also service Prescott, Prescott Valley, Dewey/Humbolt, Mayer, Campe Verde, Cottonwood, Clarkdale, and the surrounding areas.